How does the LinkPoint Secure Payment Gateway work? The LinkPoint Gateway is essentially the secure communications channel between the merchant and the banks that issue credit cards. When a customer places an order on your website or you enter a mail or phone order transaction through the LinkPoint virtual terminal, the payment information is routed to the bank that issued the credit card to the consumer for authorization. Within seconds, the authorization response is returned to your website or virtual terminal and the transaction is either approved or declined. If you are using the LinkPoint gateway for real-time processing on a website, the customer will automatically be directed to a page that indicates that their transaction is approved and thanks them for their order or to a page that indicates that the transaction was declined and offers instructions for making alternative payment arrangements. These pages can be customized by the merchant to fit their needs. Customizable email receipts can also be automatically sent to the customer and merchant for each transaction. 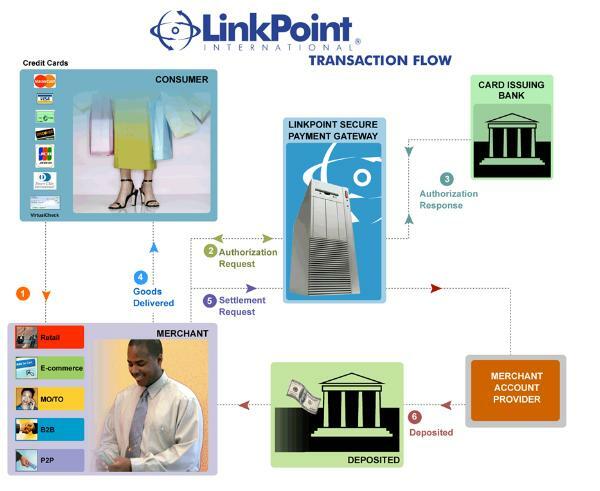 The LinkPoint gateway automatically batches transactions on a daily basis for settlement. The settlement process involves moving funds from the banks that issued the credit cards to your merchant account. Funds are transferred to your business checking account via an ACH (automated clearing house) transfer usually within 48 hours after the batch is closed. The illustration below outlines the transaction flow.